aAnalysis Limitations: A post-hoc exploratory analysis should not be interpreted to determine a treatment difference between arms at these selected time points, because of potential selection bias, insufficient sample size, and a higher probability of making a false positive error. cStratified using Cox proportional hazard model. dBased on a stratified log-rank test (stratified by geographic region, KPS, and presence of liver metastasis). References: 1. Von Hoff DD, Ervin TJ, Arena FP, et al. Increased survival in pancreatic cancer with nap-paclitaxel plus gemcitabine. N Engl J Med. 2013;369(18):1691-1703. 2. Data on file. Celgene Corporation. 3. Karnofsky DA, Burchenal JH. The clinical evaluation of chemotherapeutic agents in cancer. In: MacLeod CM, ed. Evaluation of Chemotherapeutic Agents in Cancer. New York: Columbia University Press; 1949:191-205. 4. Oken MM, Creech RH, Tormey DC, et al. Toxicity and response criteria of the Eastern Cooperative Oncology Group. Am J Clin Oncol. 1982;5(6):649-655. 5. Ma C, Bandukwala S, Burman D, et al. Interconversion of three measures of performance status: an empirical analysis. Eur J Cancer. 2010;46(18):3175-3183. 6. Data on file. IntrinsiQ Monthly Market Share Report. Ending June 2016. 7. Tabernero J, Chiorean EG, Infante JR, et al. Prognostic factors of survival in a randomized phase III trial (MPACT) of weekly nab-paclitaxel plus gemcitabine alone in patients with metastatic pancreatic cancer. Oncologist. 2015;20(2):143-150. 8. Goldstein D, El-Maraghi RH, Hammel P, et al. 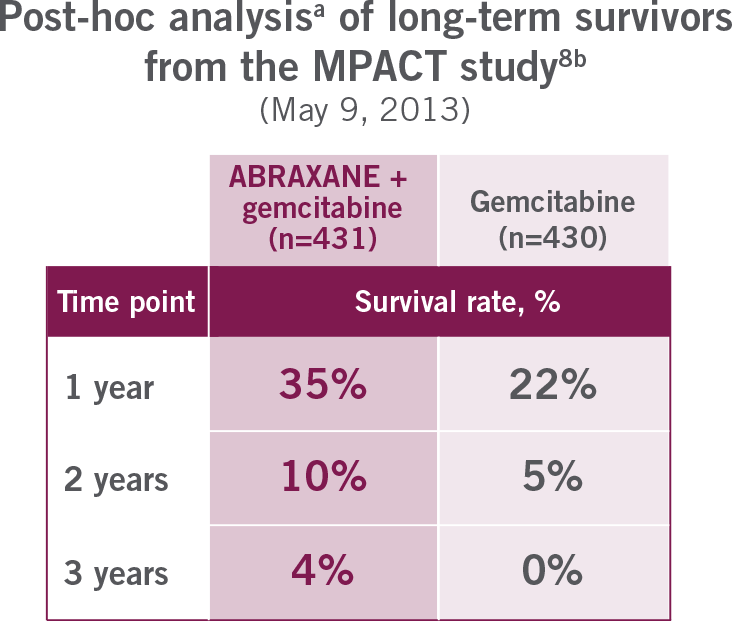 nab-Paclitaxel plus gemcitabine for metastatic pancreatic cancer: long-term survival from a phase III trial. J Natl Cancer Inst. 2015;107(2):1-10. 9. Chiorean EG, Von Hoff DD, Tabernero J, et al. Second-line therapy after nab-paclitaxel plus gemcitabine or after gemcitabine for patients with metastatic breast cancer. Br J Cancer. 2016;115(9):188-194. 10. National Comprehensive Cancer Network, Inc. Chemotherapy Order Template Pancreatic Adenocarcinoma: Gemcitabine/Albumin-bound Paclitaxel. Updated August 17, 2016. Accessed May 9, 2017. 11. Scheithauer W, Ramanathan RK, Moore M, et al. 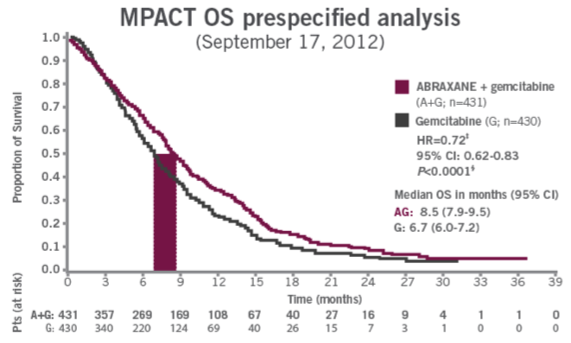 Dose modification and efficacy of nab-paclitaxel plus gemcitabine vs. gemcitabine for patients with metastatic pancreatic cancer: phase III MPACT trial. J Gastrointest Oncol. 2016;7(3):469-478. 12. Referenced with permission with the NCCN Clinical Practice Guidelines in Oncology (NCCN Guidelines®) for Pancreatic Adenocarcinoma V.2.2017. © National Comprehensive Cancer Network, Inc 2017. All rights reserved. Accessed May 9, 2017. To review the most recent and complete version of the guideline, go online to NCCN.org. NCCN makes no warranties of any kind whatsoever regarding their content, use or application and disclaims any responsibility for their application or use in any way.